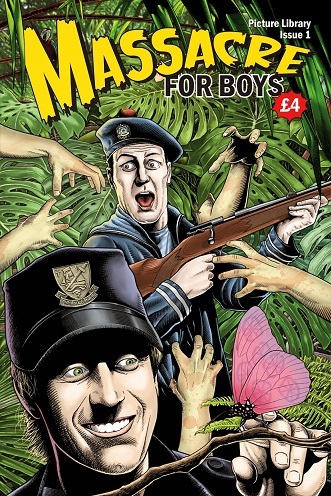 Batten down the hatches because this one is going to blow your mind!The Massacre For Boys are back in town for the biggest comic we’ve ever produced. Gaze in awe at unstoppable avians in Walking Wounded: Emu War! Follow The Crusader into a blood-soaked factory of death! Admire The Zen Fusilier as he combats the scourge of vampirism! Applaud the unbelievable flare of Bosher’s Goals! Marvel at the real-life heroism of Thirty Kroner Kincaid! Swell with pride as Britain conquers Mars! Finally discover how the First World War was won by the cricketing prowess of The Boys From Bashley! Witness the day you never thought would come as Jimmy Baker Animal Hatmaker calls for backup! Engage your brain to solve the terrifying mystery of the death of Sue Per before Sci-Fi sleuth Mustard! By Chris Denton, Steven Denton, Bhuna, David Frankum, Bolt-01, Greg Meldrum, John Caliber, Nikki Foxrobot, Owen Watts, David Herstal, Nathan Webb and Tim West. 44 pages, full colour, US format.